The 24th of June is the feast of St John the Baptist. This day also coincides with the pagan celebration of mid summer and many pagan traditions continue even down to modern times such as the tradition of lighting bonfires. 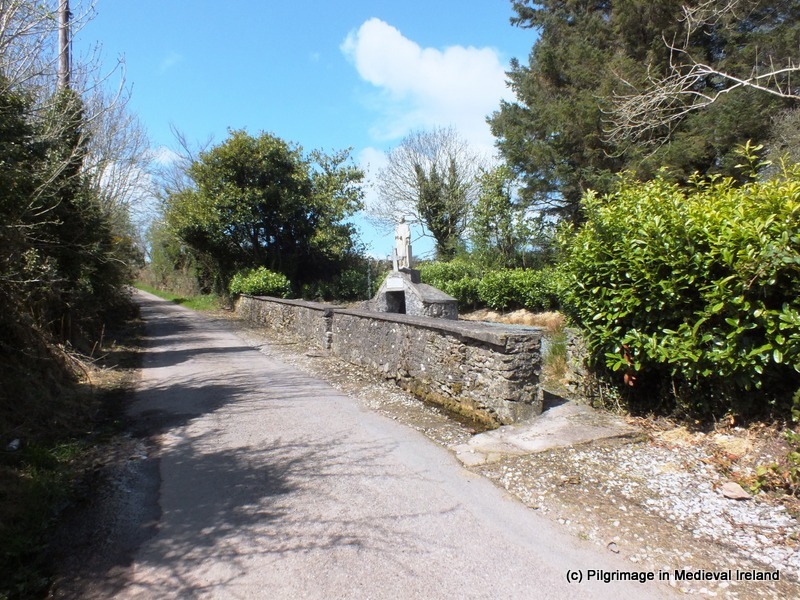 There are many holy wells around Ireland dedicated to St John the Baptist and pilgrimage is still undertaken on the saints feast day at a large number of them. 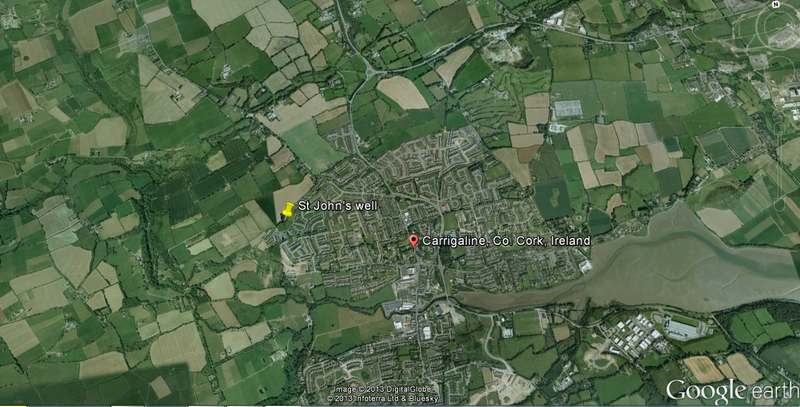 Location Map of St John’s well at the edge of Carrigaline town (taken from Google Earth). 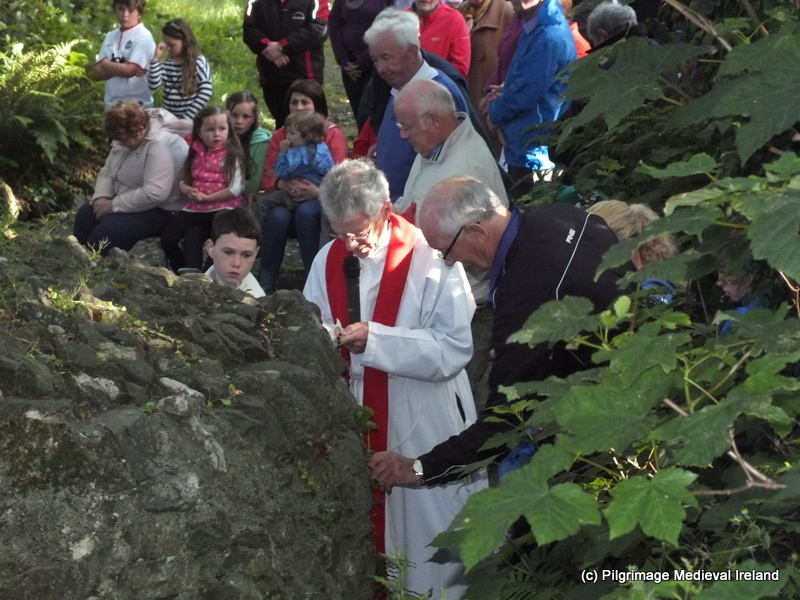 On Sunday last, St John’s Eve I attended the annual pilgrimage to St John’s well in the town of Carrigaline, Co Cork. 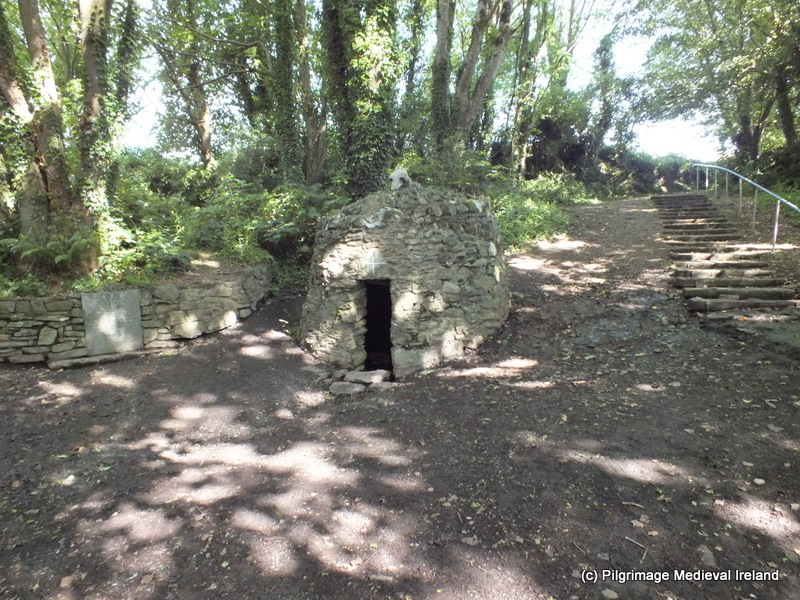 St John’s well or Tobar Eoin Óg is located in small wood in the townland of Ballinrea on the outskirts of the town of Carrigaline. Also attending the pilgrimage was Richard Scriven (Geography UCC) who is currently doing very interesting PhD research on modern pilgrimage in Ireland. For more details of Richard’s research check out his blog liminal entwinings. The 1st ed Ordnance Survey map of 1840 records the well as St Rinoge’s well elsewhere it is called Renogue’s well . Rinoge/Renogue is likely a corruption of Eoin Óg the Irish name for the well. The site consists of a spring well covered by a corbelled structure, beside the well is a large tree surrounded by a low circular wall with a stone plaque which provides a short history of the site. A number of benches are located at the site and steps made of railway sleepers make the site more accessible. A small stone altar is located opposite the well. 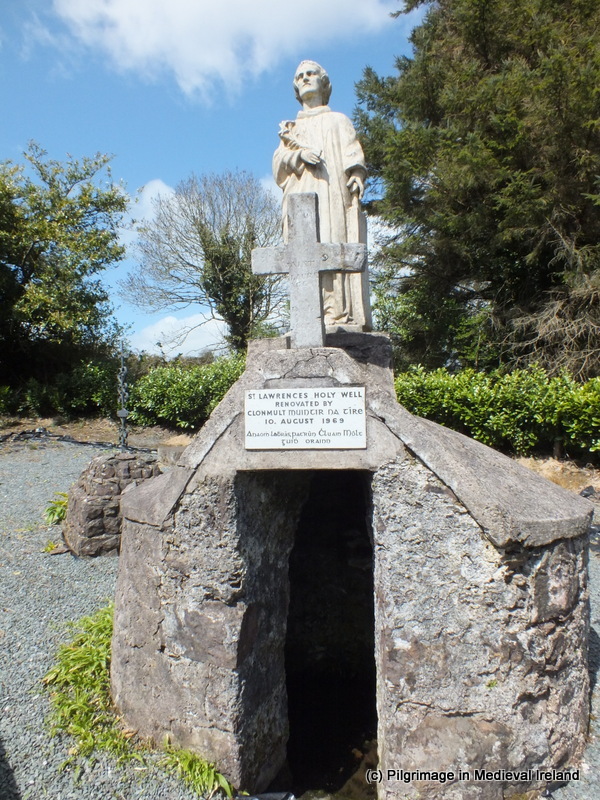 At Ballinrea there is a mineral spring, which is considered to be of the same kind as that of Tunbridge Wells, and has been found efficacious in cases of debility; and near it is a holy well, dedicated to St Renogue, which is resorted to by the country people on the 24th of June. According to tradition the well was discovered by a blind man whose sight was restored. In gratitude he built the beehive shaped stone surround, which can be still seen today. It is recorded that in the early 19th century huge crowds of people attended a patron/pattern day on St John’s Eve (23th June) at the well. 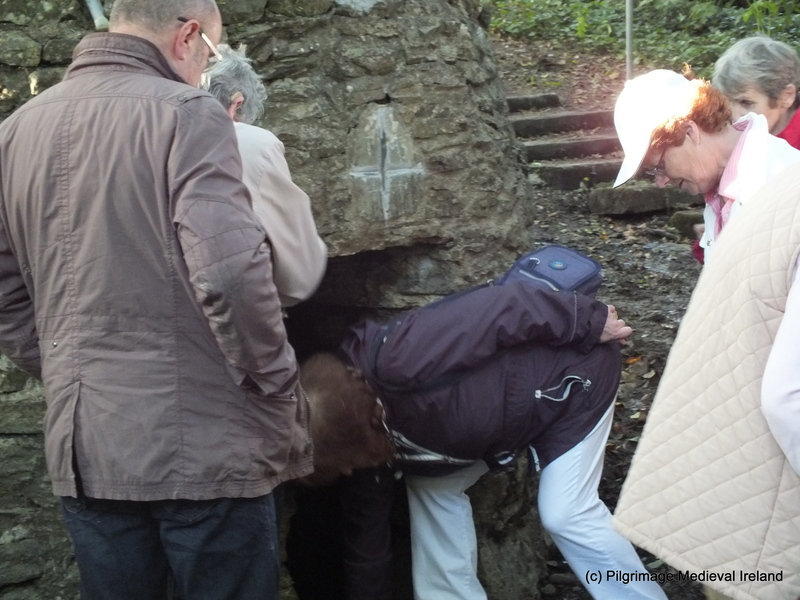 According to the plaque at the well, the water has healing powers and it is customary for pilgrims to say a decade of the rosary at each of the inscribed crosses that are found in the walls of the well house. 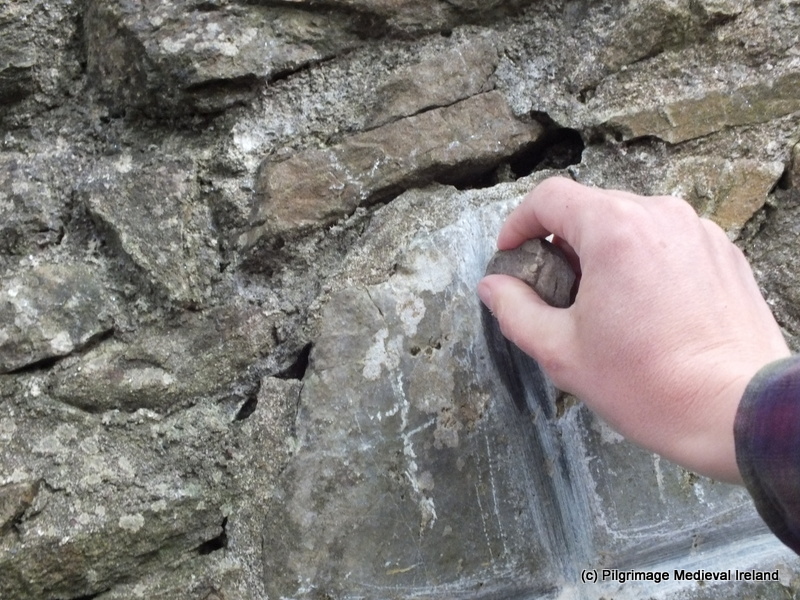 The practice of incising crosses is seen at many other pilgrim site such as St Declan’s well at Ardmore, Co Waterford and the practice seems to be a post medieval and modern tradition. Well house showing one of the incised pilgrim cross over the door of the well. 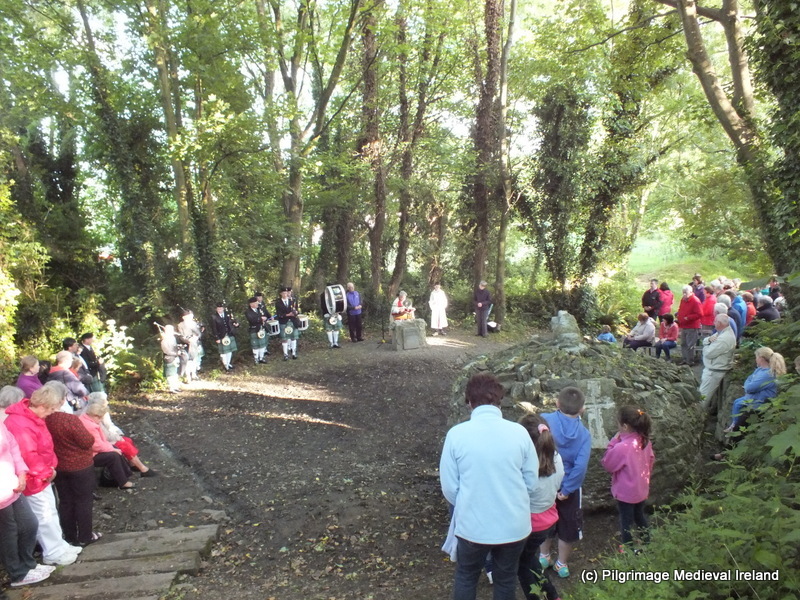 It is an annual tradition for the people of Carrigaline and the surrounding area to visit St Johns well on the eve of the saints feast. It’s a tradition which likely goes back generations. Pilgrimage in 2013 began with pilgrims gathered on the Ballintrea road close to the Dun Eoin housing estate at 7.15 pm. People stood around and chatted and waited for others to arrive. 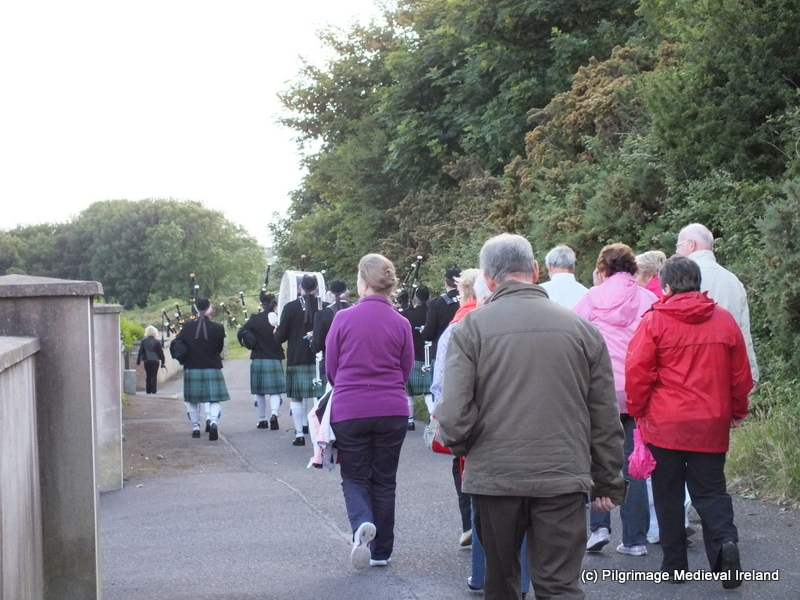 When a crowd had gathered at 7.30 the Carrigaline pipe band began a processional walk to the well. The band was immediately followed by the parish priest who was then followed by the rest of the people ( pilgrims). The Procession headed along a lane way with a signpost for the well, past some house, then on to a grassy lane which leads down into a grove of trees. The band played throughout the procession and were really excellent. 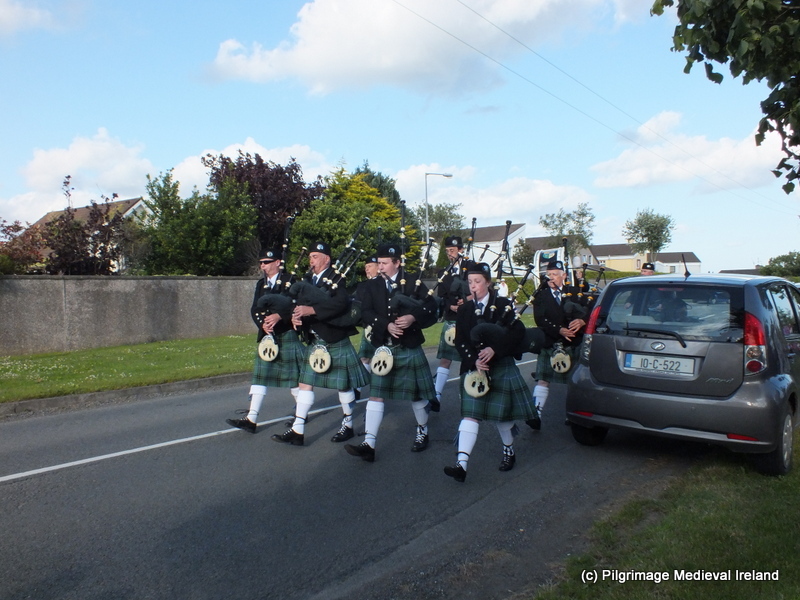 The Carrigaline Pipe Band heading the procession to St John’s well. The walk was very pleasant and took about 5-10 minutes to complete. When we all arrived at the well the band took a well deserved brake and lines up beside the alter. The rest of the people assembled around the clearing facing the stone alter opposite the holy well . 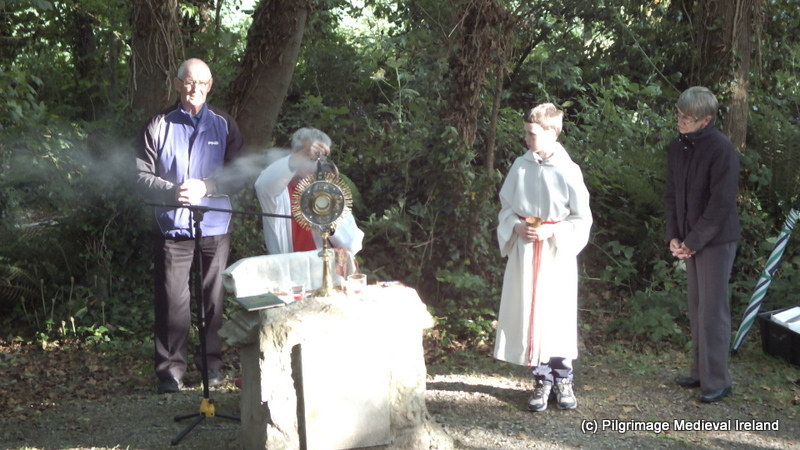 There were two priest from the parish of Carrigaline present to lead the prayers. The prayers began with the sorrowful mysteries (five decades of the rosary an explanation of rosary is in the references below). The parish priest lead the prayers and moved around the well clockwise, in the same manner as any pilgrim visiting the well to perform the stations would do. 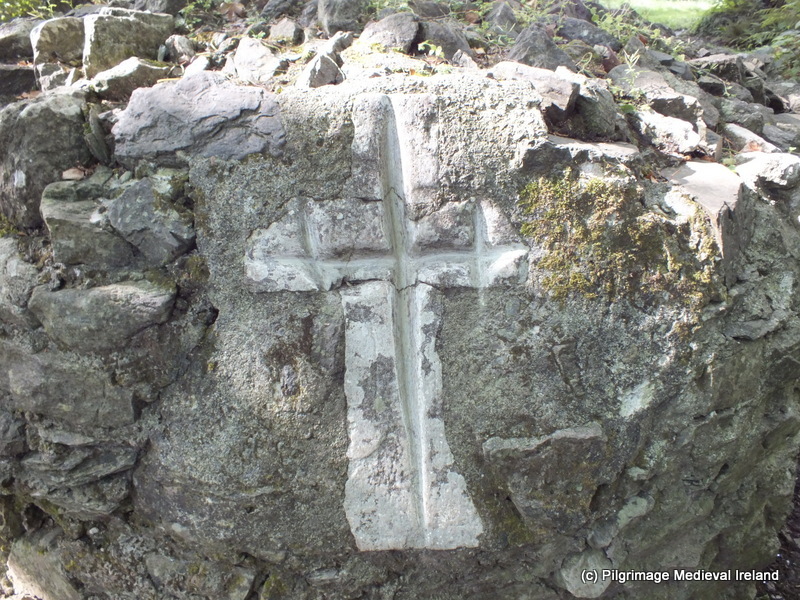 The a cross was incised with a small stone at each of the crosses around the well. When each decade of the rosary is begun the pilgrim takes a stone and scratches a cross into the incised stone. These stones five in total are located around the well and have deeply incised crosses. The crosses have been created by generations of pilgrims who visited the well. Following the rounds of the well there was a ceremony called Benediction of the Blessed Sacrament for those of you who don’t know what that is it is a devotional ceremony, the sacrament (host) is displayed in a monstrance in this case on the small stone altar opposite the well. The a priest blesses the congregation with the Eucharist at the end of a period of prayer. A number of hymns were sung by the choir and played by the pipe band such as ‘Faith of our Fathers’. When the ceremony finished many of those present lined up and took water from the well. Some of them incised the cross over the well door. Unlike other sites people didn’t seem to bring water bottles with them. I returned to the well the following morning, to see what it was like without the hustle and bustle of people. It really is one of the most beautiful wells I have visited and so peaceful with lots of singing of the birds. A few days ago while driving to Cork, I took a small detour to the village of Clonmult. Clonmult, Co. Cork is best know as the site of an IRA ambush which took place on the 20 February 1920 during the war of Independence. On the outskirts of the village is a lovely holy well dedicated to St Laurence. 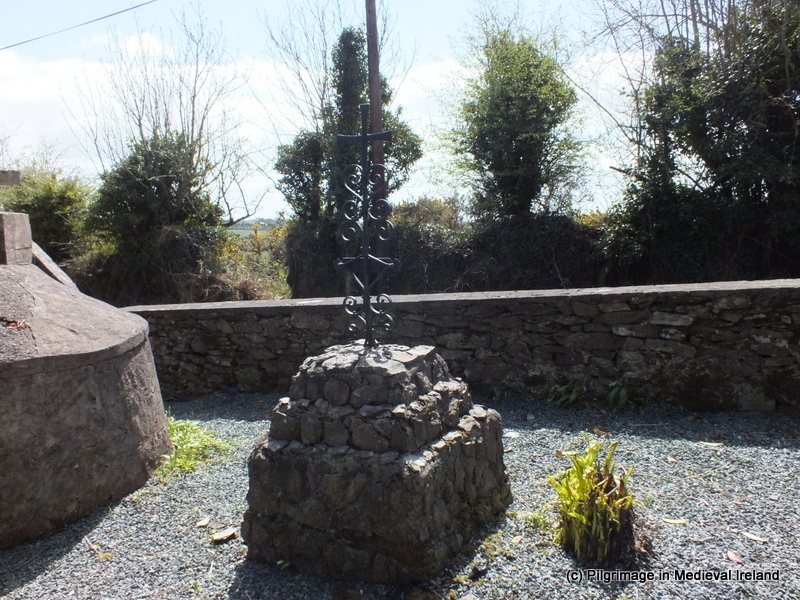 St Laurence’s well is located in the townland of Garrylaurence/Garraí Labhráis meaning Field/Garden of Laurence. It is located in a small enclosure beside a narrow road that runs through the townland. The well consists of a natural spring with a circular well house, with a corbelled roof covered in concrete. The well house looks like it was built in the 19th century. A plaque over the doorway states ‘St Laurence’s Holy Well Renovated by Clonmult Muintir na Tíre 10. August 1969‘. The well is accessed through a narrow doorway . There is a step down into the water and inside the door on the left is a small recess. Power writing in 1917 mentions the recess kept an iron drinking-ladle attached to a chain. 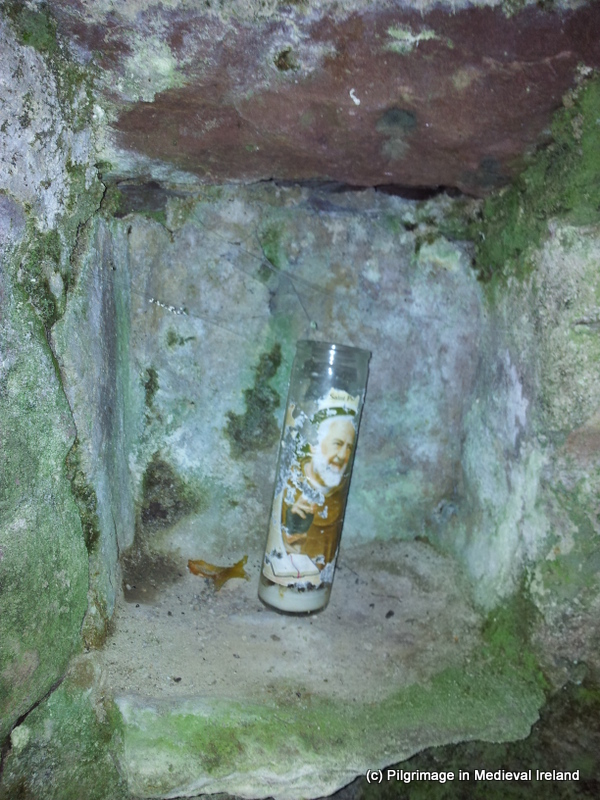 On my visit there was a small candle with Padre Pio in the recess. A large statue of St Laurence and a small stone cross bearing the inscription INRI Saint Laurence and the date 1824, sit on top of the roof. 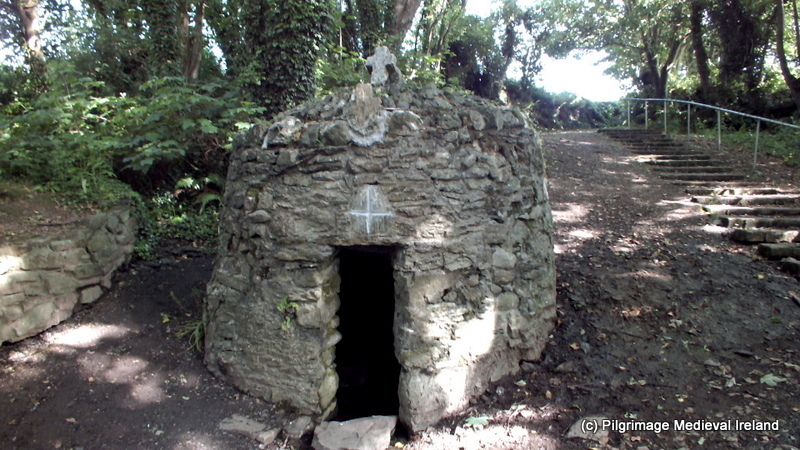 The holy well looks well maintained and appears to be still in use. Beside the well is a small monument with an iron cross. St Laurence is Laurence O’ Toole a 12th century Irish saint who was abbot of Glendalough and later Bishop of Dublin. He died in the monastery at Eu, in Normandy and his tomb in Eu became a place of pilgrimage and many miracles were attributed to his intercession. He was canonized in 1225 by Pope Honorius and his remains were translated to a tomb in front of the High Altar on the 10th of May.The nearby church church at Clonmult is also dedicated to the saint. The saints feast day is the 14th of November , but the 9th of August was the main day for pilgrimage at Garrylaurence. In 1917 Power records that rounds were made here chiefly on August the 9th and votive offering of ‘usual character ‘ on the tree branches ‘which are immediately over the scared fountain’. Power, P. 1917. ‘Place-names and Antiquities of S.E. Cork II’, PRIAI, 184- 230.